This is the first time I have ever seen, cooked or tasted raw jack fruit in my life. I know some of you might be very surprised. Just as one of my friends said "It cannot be true, I cannot imagine someone not having tasted panasa pottu koora". But then here I am :). Anyway my cousin, Mallika shared this recipe and urged me to make it and she was positive that we would love it and sure we did!! Apparently it is a treasured recipe from one of her friends. I later on came to know that it is a traditional dish in some parts of Andhra. Since I was not sure of the authenticity, I asked one of my friends to taste it and let me know if it came close to the traditional. She gave her stamp of approval and so it appears here !! She says that there are many ways of preparing this curry and most of them include addition of tamarind pulp. The variations are for another day. Here is the fry for you to enjoy as part of Day 3 Week 2 of BM #27. This is what I got after draining the raw jack fruit and washing it. 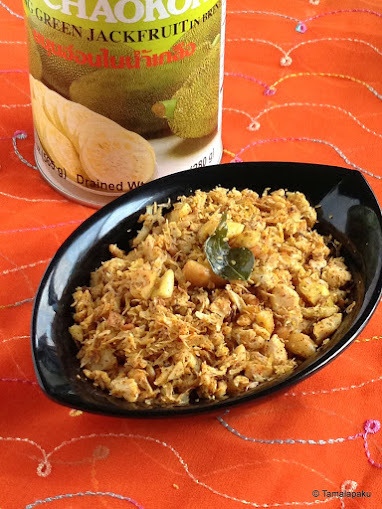 I used a food chopper to chop the raw jack fruit to required size. In a heated pan, add oil and the rest of the seasoning. After the mustard seeds pop and the dals are brown, add the chopped raw jack fruit and fry for about 10-12 minutes until they are cooked and tender. Sprinkle salt, turmeric, mustard powder, red chilli powder, cashews and coconut powder. Mix well and cook for a few minutes more and remove from fire. Serve it warm with steaming hot rice and enjoy! Harini..okay even I have never tasted jack fruit..infact we do not get it here...just dont know what it would taste like!! Never tried anything till now with raw jackfruit,stir fry looks beautiful and seriously a fabulous dish to try. This is new and nice Harini, I have never tasted raw jackfruit.. I like jackfruit and you can make a masala curry with chole masala. I always have canned jackfruit in the pantry. Love the addition of mustard powder to the curry. Will try this version next. I am also with you in this though I know about the dish. I have never seen any one from our families cooking it though we come from Andhra region. Idhi mari uttaradhi valla vanta anukunta. I have heard from other ones who are from the region cooking it. Well I am in a region where it is called "Kule" and its is available in plenty. In fact the market is filled with them. But I do not buy it as it is not available chopped and the effort needed in chopping it up for 1 person is tooo much. One person because I am the only person who will eat it. But its a very very tasty veggie, You have done a fine job here. Recently I came to know where to get raw jackfruit it's a awesome dish. You won;t believe if I told you I never cooked with jackfruit.When I look for it its not available and when its available I am not ina a mood to cook it!